Quick Study: Solomon Volkov is a Russian-American historian whose work focuses on Russian cultural history and its colorful figures. The Volkov File: Many of Solomon Volkov’s writings draw on his professional training as a violinist and musicologist, and he has written books—some structured to document conversations—about such cultural figures as Dmitri Shostakovich, George Balanchine, and Joseph Brodsky. Volkov’s most recent book to appear in English translation is Romanov Riches: Russian Writers and Artists Under the Tsars, which begins with the first Romanovs and ends with Vladimir Lenin. 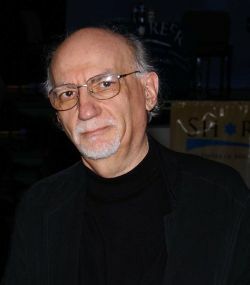 Volkov emigrated to the United States in 1976 and serves as a cultural commentator on Radio Free Europe/Radio Liberty. Volkov’s Places: Uroteppa/Leninabad, Tajikistan: Born. Leningrad: Studied at Leningrad Conservatory. New York City: Lives there. Volkov on Volkov and Writing: In a 2011 interview with Chayka, Volkov said he wouldn’t have written all his books without his wife, Marianna, “She has participated in absolutely all my book projects in one way or another. It’s awkward for me to dedicate books to my wife, as many writers do, but each of my books is essentially dedicated to Marianna.” Volkov went on to mention that Marianna Volkov took seventy photos in his History of Russian Culture of the Twentieth Century, and that she has published ten photography books. Volkov Recommends: In his 2011 interview with Chayka, Volkov said he thinks Mikhail Sholokhov’s Quiet Flows the Don is a great book. He also mentions enjoying reading essays by Lev Rubinstein and says he follows the work of Viktor Pelevin and Vladimir Sorokin.